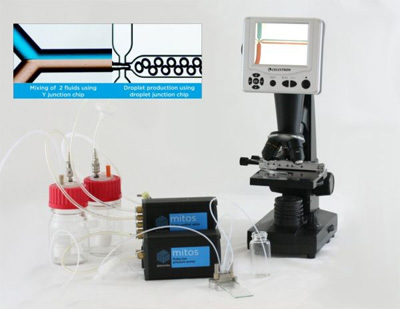 The compact, highly portable system enables users to create small droplets, mix fluids or observe microchannel flow, allowing them to investigate or demonstrate a wide range of microfluidic applications. It offers customers the flexibility to choose between using either their own PDMS (polydimethylsiloxane) chips – with the PDMS Chip Interface – or Dolomite’s range of glass chips, including 2 Reagent Droplet Chips, Micromixer Chips and Y-Junction Chips. Powered and controlled via the Mitos Fluika Control Software using a USB port, the kit represents the ideal microfluidic starter system, offering exceptional value with a modular, flexible design that can be tailored to a variety of applications. The Educational Microfluidic Starter Kit achieves reliable droplet production and fluid mixing. The Educational Microfluidic Starter Kit is accompanied by an application note –Introduction to Mixing and Droplet Production in Microfluidics – which gives a taste of some basic principles of microfluidics, demonstrates simple, robust and dependable set-up configurations, and shows how to achieve reliable droplet production and fluid mixing.